Our award-winning comedy night returns on Wednesday 2nd March for an extra special line-up. Those who came to the last sold out event will be excited to hear that amongst the incredible five comedian line-up is the incredible Joe Bor, better known as Jasper Cromwell-Jones. Matt Lucas celebrates the comedian for “those who like their comedy funny”. Jasper is a rugger-top clad lad who likes a “posh off” and admits to playing “soggy biscuit” (those who know, know!) He leads us through his life “on the lash”, his relationship with his friends including Barny Fish fingers & drinking songs. 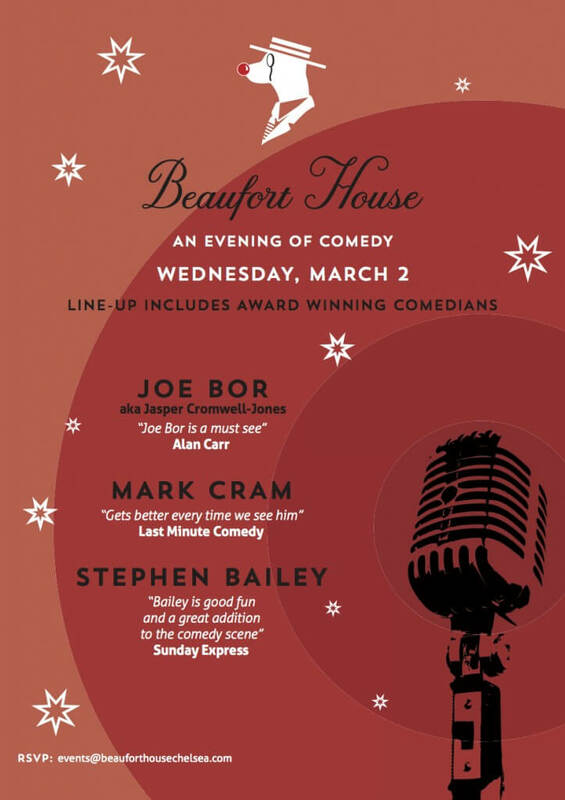 Other comedians include the brilliant Mark Cram, and the laugh-out loud, Stephen Bailey. Tickets are only £5 per person & includes a complimentary Spiced Pear Mojito on arrival, so book today to avoid disappointment. To book online click HERE. For any queries please contact info@beauforthousechelsea.com.